Nanci stitched and finished it herself. This piece will definitely be tucked away safely at the end of Christmas and added to the holiday display for many years. This project used acrylic paint, brush trees, and buttons. The roof is a sheet of glitter sheet and the added lights are from a Darice trim. Hey! I thought Nanci wasn’t supposed to be “crafty”?????!! Well, if I’m remembering correctly, she may not be “crafty”, but she sure is talented…that’s a beautiful piece & I know you will treasure it forever!!! Love the birdhouse too…I think she might be more crafty than she wanted us to know at Mania ; ) !! Thanks for featuring her as a Guest Designer! Thank you, Scrappy Mama. She is very appreciative of your comment. And you are right, I treasure my “Merry Little Christmas” piece. 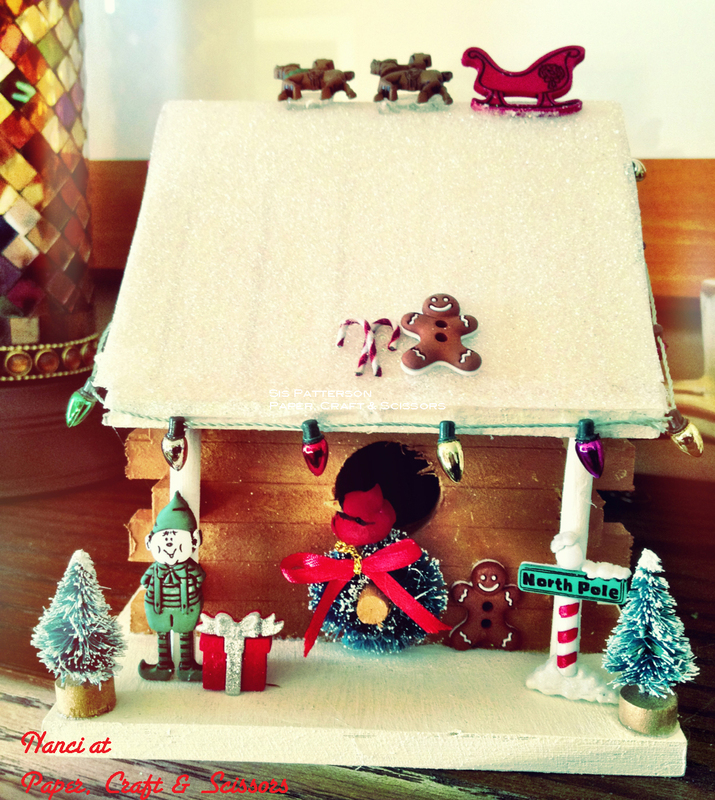 Oh, I love that you featured Nanci on your blog! I remember seeing her beautiful stitchery in Atlanta- so glad you posted this! The stitching is lovely! 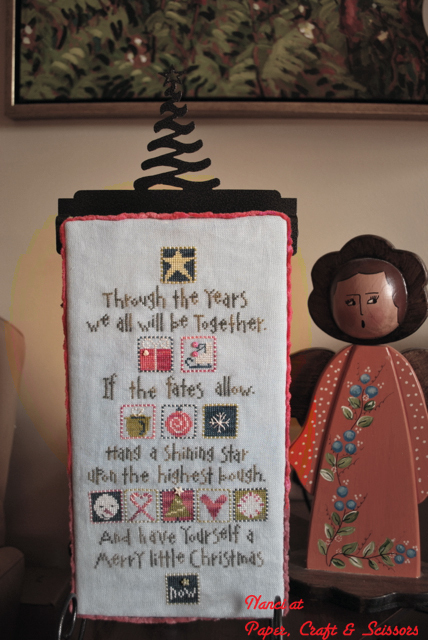 Love the beautiful message from the song and gorgeous, masterful stitching! The birdhouse is so fun and imaginative!! Love the lights around the roof! Absolute treasures!! Thank you, Sis, for sharing her talents here!! Yay Nanci! These are wonderful. Thank you for posting these. The cross stitching is beautiful. You do fabulous work Nanci. I would totally take up residence in that bird house if I were a few inches shorter. 😉 Thanks for sharing your work. It was a treat to see your creations. Nanci~ your cross stitch is beautiful!! And the birdhouse is just fabulous. I love the wreath hanging on the entrance. I can’t wait to see what you come up with next!! Incredible Cross Stitch! Gorgeous! I am a birdhouse lover and think the birdhouse is amazing! Nanci is extremely talented. Its great to see her work featured here.